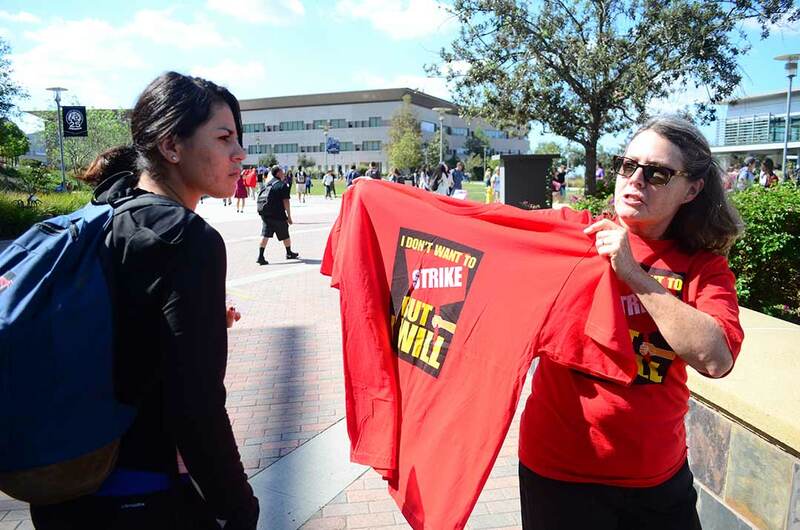 SAN MARCOS — Cal State University professors across the state — including at CSU San Marcos — who were poised to go on strike for a 5 percent raise in salary will not strike as both sides of the labor dispute reached a tentative agreement late last week. The California Faculty Association announced on April 8 that its board of directors and CSU management had reached the agreement, which calls for, among other things, a 13 percent raise spread over the next three fiscal years, including a 5 percent raise June 30. The faculty association president praised the union membership for their role in the negotiations in a prepared statement. The agreement also calls for the minimum raise when a faculty member is promoted to go from 7.5 percent to 9 percent and includes language that guarantees faculty full retiree health benefits who are hired on or after July 1, 2017 and retire at age 50 with 10 years of service. Union leadership said that the state university’s teachers have had one raise since 2007 — a 1.6 percent salary increase in 2014 — and as a result, many teachers find themselves working multiple jobs and taking other measures to stay financially afloat, which takes away from the time they can spend focusing on their students. White’s office has offered a 2 percent salary increase, which the union rejected. State faculty voted last year to authorize a strike if their demands were not met. The strike was scheduled to take place April 13 through 15 and April 18 and 19 before the agreement was reached.